For years, I've been saying that the key to telling better stories is to begin focusing on "High Concept" stories. But for some reason, Australians tend to equate "High Concept" with "Big Budget" -- and automatically rule it out, because they think the local film industry can't afford expensive films. Well, they're partly right: the local industry can't afford expensive films with Hollywood style budgets. But they're wrong in thinking "High Concept" equals "Big Budget". High Concept stories don't need to be expensive. To apply "High Concept" to the "Low Budget" world outside Hollywood, we need a slight adjustment in the way we develop High Concept stories. In a nutshell, the key is develop character-driven and/or "situational" stories that satisfy those four components. Two men wake up shackled in a basement on either side of a dead body, prisoners in the lair of serial killer who finds gruesome ways to make his victims do something vicious to escape their own death. The concept itself (as a horror/thriller) is inherently compelling. Does it satisfy the four components of a High Concept story? You bet it does! And, yet, it's a simple location, allowing the story and the elements within the story to be kept within the reigns of a tight budget. The writers tell a gripping, roller-coaster ride of a story, that satisfies its audience -- horror/thriller fans. With a $1.2 million budget (US dollars), well within the Australian film industry's reach, SAW made over $50 million at the US box office. When you're developing stories for the Australian marketplace, a situational High Concept goes a very long way. 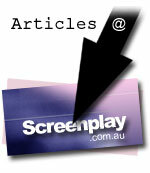 Remember: the FAST Screenplay™ will help ensure that you're starting your script on the right track! Be sure to take advantage of this limited opportunity!